Thirty or more German FW-190 fighters made vicious attacks in rounds of two or three fighters immediately after the bombers left the intense flak (anti-aircraft fire) over the target. 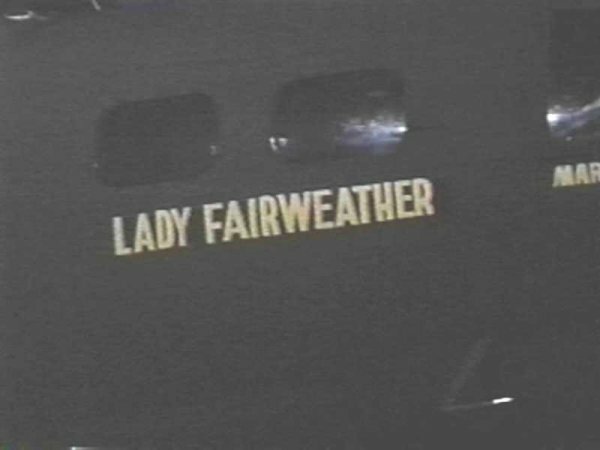 "Lady Fairweather," on her second credited combat mission, was seen to hit the water in flames in the Atlantic Ocean, in the Bay of Biscay, near Belle Isle. Four parachutes were believed to have been seen descending at the time of the encounter. The entire crew was killed in action and no bodies were recovered. The names of the ten KIA crewmen can be found on the Wall of the Missing at the Cambridge, England American National Cemetery. 2Lt Francis McMurtry (CP)(KIA) - Commissioned as Pilot on 3 July 1942. Assigned 359th BS 25 Sept 1942. Dispatched on three combat missions: With Reddig Crew 11/18 and 11/22/42; Did not fly with the Reddig crew on their 23 Nov 1042 mission. With the 1Lt Orville S. Witt Crew on 303rd mission #7, 20 Dec 1942 to Romilly, FR, in B-17F #41-24566 Zombie (359BS) BN-W. Shot down by enemy fighters and ditched in the English Channel. All ten crewmen were KIA. 2Lt John Ercegovich (N-KIA), Sgt Robert W. Van Fleet (E-KIA), Sgt Devon B. Nolen (R-KIA), Sgt Gerald A. Sturgis (BT-KIA) and Sgt Ferrell A. Mann (LWG-KIA) - Dispatched on each of the 1Lt Reddig crew combat missions. Pvt Alexander S. Grieb (RWG)(KIA) - Assigned to 303rd BG(H) at Biggs Field, TX on 15 Sept 1942. Did not fly with crew on their October 1942 flight from the USA to England. Transported as part of the Ground Echelon on the RMS Queen Mary, at Ft. Dix, NY 28 Aug to 4 Sept 1942; Departed NY City Harbor 5 Sept 1942; Arrived Greencock, Scotland 11 Sept 1942; To Molesworth, via train, on 12 Sept 1942. Promoted to Sgt and became the Reddig Crew Tail Gunner on each of the three Reddig Crew combat missions. Sgt George T. Senior (TG)(KIA) - Flew with Reddig Crew on their October 1942 flight from the USA to England. Reassigned as Right Waist Gunner. Flew on each of the three Reddig Crew combat missions. Original Reddig Crewmen - Not in photo - Deleted from crew before the crew departed the USA. Sgt Edmund Q. Borysiewicz (WG) - Reassignment unknown. No known 303rd Combat missions. S/Sgt Melvin M. Tanzer (Gunner) Transferred to 427th BS in an unknown administrative position on 25 Oct 1942. Capt Charles G. Miller (CP)(KIA) - This was his only 303rd Combat mission on his orientation combat mission as CoPIlot. 2Lt John W. Plummer (B)(KIA) - Member of the 1Lt Ellis J. Sanderson Crew. 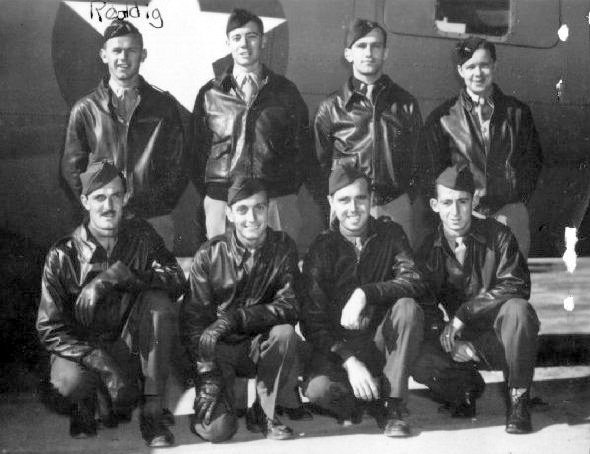 Flew on two additional combat missions with the Sanderson Crew:: #1 - 17 Nov 42 & #2 - 18 Nov 42.